The 2016 presidential election cycle has experienced a wave of publicity regarding potential election rigging; while out and out election fraud is not common, changes to state laws since the 2010 election have made it harder for voters to cast their ballot. 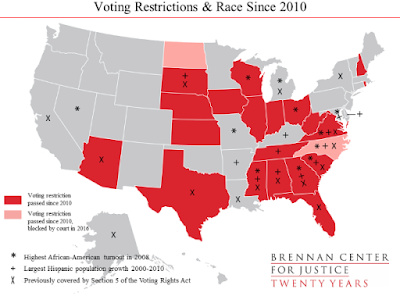 A study by the Brennan Center for Justice at New York University School of Law breaks down the impact of these changes on the voting public. 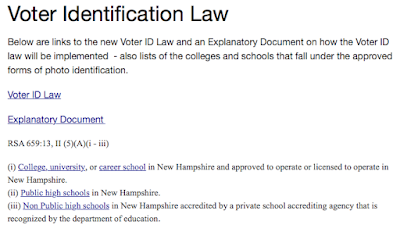 Additionally, a law has been passed that requires voters to provide documentary proof of citizenship when they register to vote. This law was blocked by a federal appeals court on September 9, 2016 but is subject to ongoing litigation. 2.) Indiana - voters may have to provide proof of identification to additional party-nominated election officers, a duplication of the former voter identification requirement. 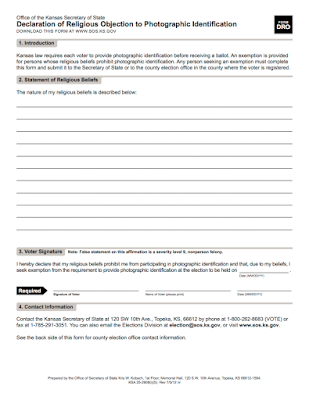 If a voter does not have any of these forms of photo ID, a free Mississippi Voter Identification Card will be supplied by any Circuit Clerk's Office within the state. 5.) Nebraska - In 2016, the early voting period was reduced from a minimum of 35 days to no more than 30 days. If voters do not have acceptable identification, they will be photographed at the polls and the photograph will be attached to an affidavit. 7.) South Carolina - For the first time in 2016, photo ID is required to vote, however, an alternative is available for those who have a reasonable impediment that prevents them from obtaining photo ID. 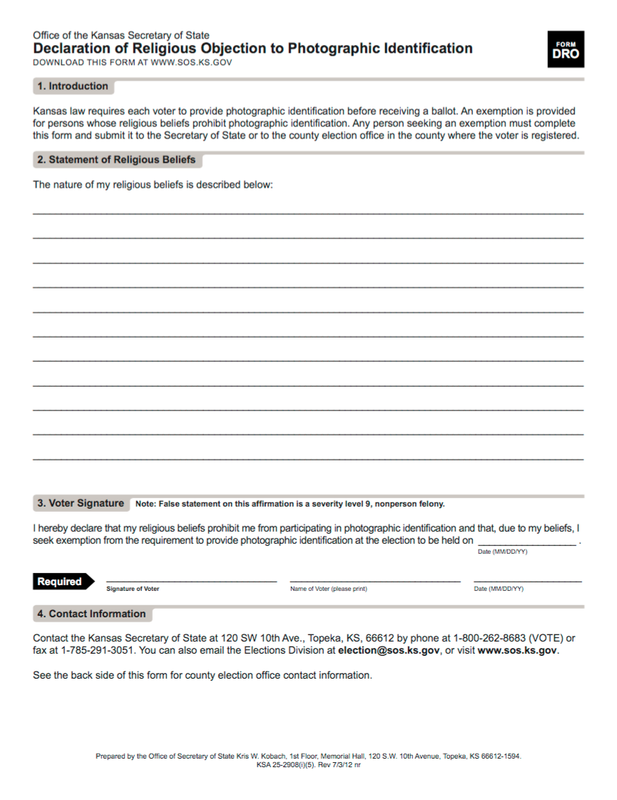 Interestingly, if you are registered to vote but don't have a photo ID, you can go to your county voter registration and elections office, provide your date of birth and the last four digits of your Social Security Number and have your photo taken. South Carolina even provides guidelines outlining the attire and appearance guidelines for these photos. 1.) Florida - cut early voting, curbed voter registration drives, made it more difficult for people with past criminal records to have their voting rights restored. 2.) Georgia - reduced early voting period from 45 days to 21 days and cut early voting the weekend prior to election day. 3.) Illinois - curbed voter registration drives. 4.) Iowa - made it more difficult for people with past criminal records to have their voting rights restored. 5.) South Dakota - made it more difficult for people with past criminal records to have their voting rights restored. In the cases of Florida, Iowa and South Dakota, the legal moves against people with criminal records means that citizens with felony convictions are more or less permanently disenfranchised. I have found this process of disenfranchisement with quite a bit of interest over the past six years given that the United States likes to promote itself to the rest of the world as "the" model for democracy. While there are some very interesting examples of voter fraud that have resulted in convictions, as a percentage of total votes cast in elections of all types (i.e. federal, state, local), the number of fraudulent votes cast appears to be quite small. 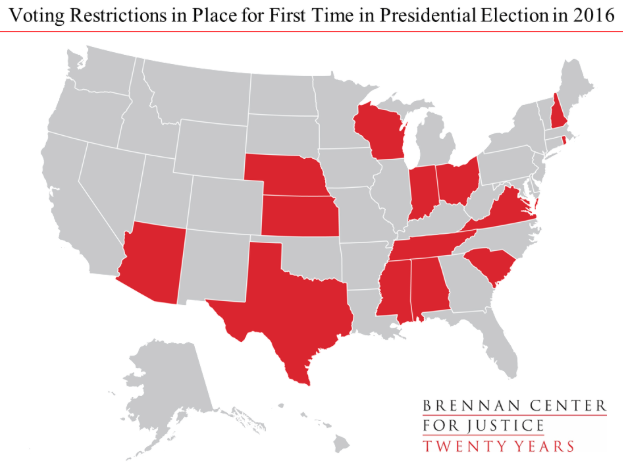 As we can see from the study by the Brennan Center for Justice, America's democracy is under siege as some states have implemented laws that either make it more difficult to vote or impossible to vote under some circumstances, a process that seems to show that democracy is heading in the wrong direction. 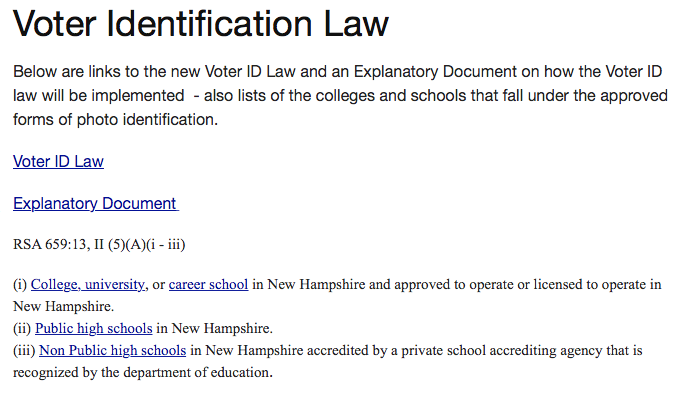 What the hell is wrong with requiring voter id? Vote fraud is more of a problem than you think. ID required for almost all the normal activities of living. It's statistically insignificant, that's what. We should spend our time dealing with things that are actual problems, not trying to find problems that don't exist (see also money spent -- and wasted -- by states drug testing welfare recipients).